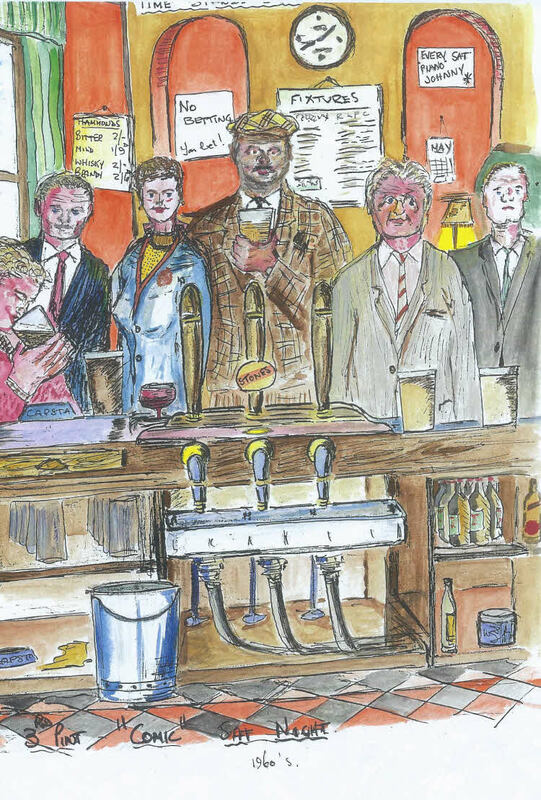 Drinking mates at The Commercial, Dewsbury Road, Flushdyke, Ossett and also known locally as “The Comic”. From left to right Brian Oldroyd, Louis Rozicka, “Timmy” Eileen Mitchell, barber Jack Hiendley, Herbert Fozard and Tommy O’Connell. In the 1830s, the Commercial was known as the "Traveller's Rest" or just the "Traveller's" because of its position on the Wakefield - Halifax turnpike road. Although the public house wasn’t technically in Flushdyke, and is located at the bottom of Dale Street, it was very well patronised by Flushdyke folk. The Commercial Hotel served Hammond's Ales and the cellar was classed as the best beer cellar in Ossett, even though it flooded regularly. Albert Vause and Wilf Grogan were the landlords in the 1950s. In the next 50 years the Commercial had 14 more licensees. In late December 2011 planning consent was granted for 9 dwellings at The Commercial Public House and land to the rear. The Commercial Hotel is a Hotel no more and has been converted into flats with housing development currently (June 2016) underway to the rear of the former Public House.